Two hundred and fifty years after my planned 1690 to 1720 historical/imagi-nation style set up for the Balkans sees global encompassing the second world war. What is the connection between the two? Well, once I have finished the disposal of Eric's late 17th and 18th century unpainted lead mountain I will then be tacking a peak of similar scale in the shape of his 20mm WW2 collection. 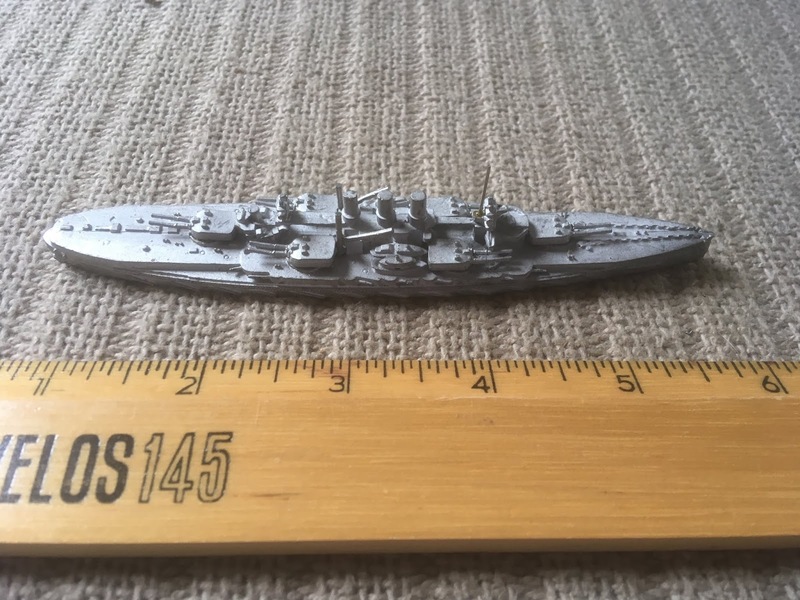 I had a long conversation with Bill, Eric's son, about the next steps with the disposal plan and we have taken the decision to tackle the WW2 unpainted collection first of all. When Eric retired and moved to Coningsby he got into WW2 gaming in 20mm in a big way. When I say big way I mean big as in Cecil B. Demille spectacular big - Eric was never one that went for the 'less is more' approach! In real terms it means that I shall be receiving some dozen or so 32 litre crates full of unpainted 20mm metal figures, artillery and vehicles - the latter are mostly metal or resin and metal - for disposal. In true Eric fashion these have been deployed in units and as far as we know at present there is a lot of Foundry in the collection. 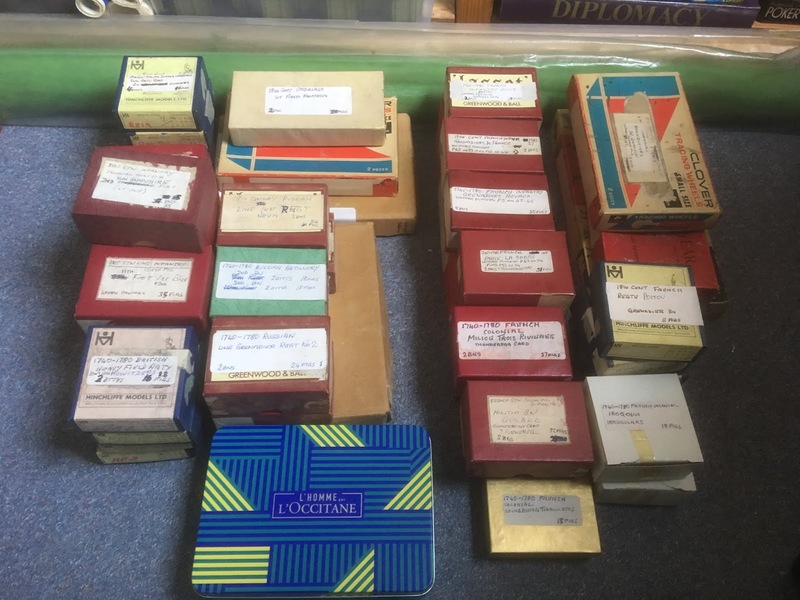 In the short term I need to strip out the remaining Front Rank and Foundry elements of the 17th/18th century collection and then organise the remainder into manufacturers so there will crates of Essex, Dixons, Hinchliffe and others. If I tidied up the crates I have I reckon I could condense the remainder down by around a half which is not bad going and of course it save me some space. Just as well with another 12 crates incoming! I should mention that Eric's WW2 collection covers the entire war and with multiple armies and theatres represented. I am looking forward to tackling this but it will not be easy if the earlier stuff is anything to go by. First and foremost a belated Happy Easter to all - I hope the long weekend was a pleasant one however you chose to spend it! St. George doing what he does best - skewering the odd dragon! 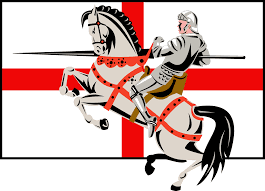 Of course another celebration to day in honour of our very own Patron Saint so a Happy St.George's day as well! It was a veritable whirlwind of a weekend including two barbecues, a boot sale, three shopping trips, a further al fresco dinner, jet washing the patio, a party in between times, further sorting out of Eric's collection. Now that the Wargames Foundry infantry has more or less gone my next step was to sort out the cavalry. This has proven to be a major headache as Eric not only used a number of manufacturers but also routinely mixed ranges within a unit. This will take me longer than I anticipated to sort out so apologies for the delay in getting a list together. What I can confirm though is that Eric did not use Front Rank for the mounted arm - the main bulk appears to be Dixons and Essex. 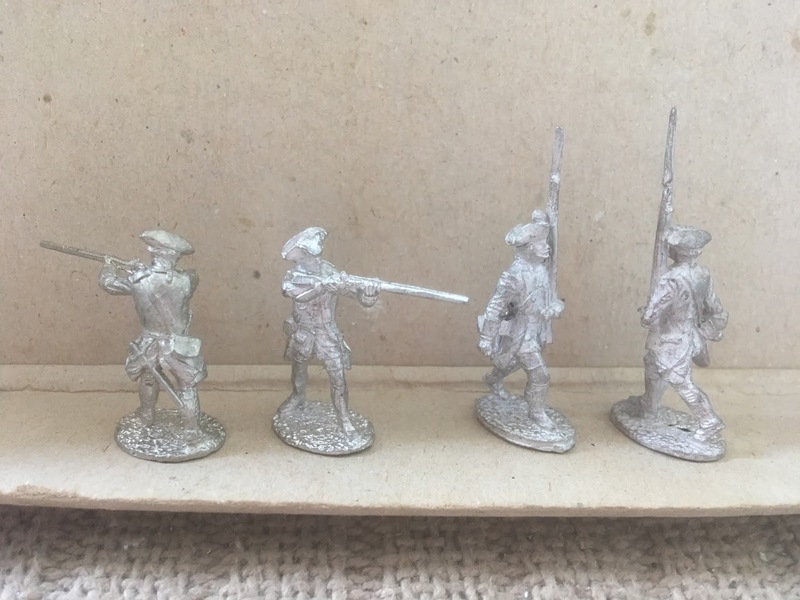 The Russian and Austrian Seven Years War armies both included a large number of Front Rank infantry and cavalry all of which will be heading to their new home at the weekend. I will then be sorting out the British and French which also feature significant quantities of figures from this manufacturer. Once the high end ranges have been disposed of - and by that I mean Foundry and Front Rank - the next will be Dixon and Essex as there is a prodigious amount of them in the collection. These are all perfectly usable and would be a cheap way of trying out a new period as the prices are very low - 50p per foot and £1 for mounted. These are 30mm and are quite exquisite in a Charge! kind of way. Whilst going through the Austrian Seven Years collection I came across two infantry regiments made up using the figures depicted above. These are lovely figures but I am at a loss to identify the manufacturer. If anyone has an ideas please let me know. There are grenadiers in the same positions as well as officers, drummers and standard bearers and a quite superb mounted officer which is a one piece casting. I have a feeling they may possibly be Hinchliffe - the mounted officer certainly is - but the round base seems a little out of place. 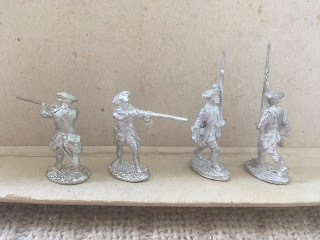 This coming week will see me packing figures for posting but as the decks are beginning to clear, albeit slowly, I will be better placed in respect of the remainder of Eric's 18th century unpainted lead mountain. In fact it will be more like a lead hill! 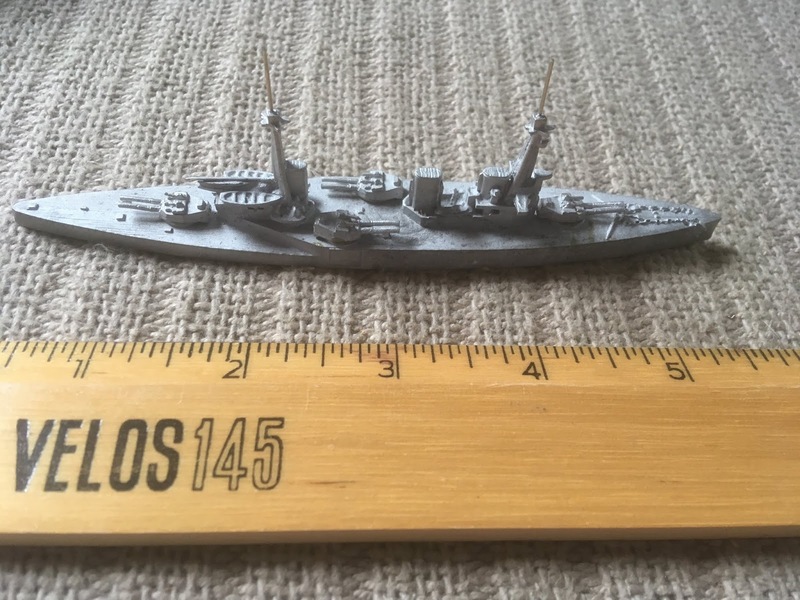 "I saw three (actually six) ships go sailing by...."
The naval portion of Eric's collection is a seam waiting to be mined in due course so I was rather surprised to find the following items lurking in a box described as 1685 Sedgemoor. There are two of each model and after some investigation it appears that they are early Superior models, currently available from Alnavco in the US of A.These models never saw action during the campaign and are pretty good condition considering they have been in storage for something like 35 years! 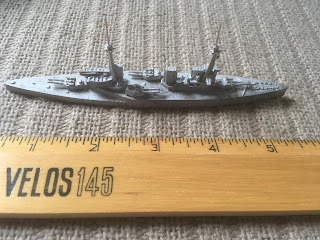 All the turrets are present and correct - Eric had glued these in place - and the only damage appears to be with the masts of the Helgoland class. They are very attractive models and would certainly have been useful during the SE Asia campaign - especially for the central powers, given their losses! No prizes for guessing what will be featuring prominently in this post! This post will be more like 'The Weekend Sitrep' rather than the weekly version - mainly because the weekend was quite a busy one! I finally managed to get some cheap storage crates to decant those parts of Eric's collection that were in crates that were battered beyond the point of salvaging. I also took advantage of the price to lay in some extra so that the man cave now looks a little more organised. Having a floor covered with assorted piles of boxes and crates constituted a health and safety issue as the floor space was at an absolute premium! The resulting 'moving and shaking' meant that I was able to separate out all the late 17th and Marlburian cavalry for cataloguing and identification purposes. For the record there is around two crates worth of horse, all of which is still in Eric's original unit sized boxes. I have also pulled out all of the Minifigs units from across the entire collection although I fully expect to find more given that Eric often made up units with odd figures from varying manufacturers. Having done this I would say that there is probably slightly more figures from the Seven Years War than the Marlburian period but in either case there is plenty of choice - probably too much for me if truth be told. One thing that did surprise me though was the amount of ECW Minifigs that Eric had assigned to some of the armies. We are certainly not talking whole armies here but certainly sufficient to form the basis of a Portable Wargame style set up for the period. By far and away the biggest component of Eric's Seven Years War collection was the French Army. A lot of the Infantry appears to be Greenwood and Ball although I am unsure. I will get to them once the Marlburian and earlier ranges have been disposed of as far as possible. I also found some artillery! Lurking in the Danish and Russian collection were several packs of Front Rank field guns and howitzers. Lord alone knows how long these had been in storage but suffice it to say that the wire used for the axles had a generous coating of rust! This will be up for disposal in due course as for my own need I will be using Minifigs artillery. A few other mysterious offering appeared - sorry, no pictures yet - including a unit of what Eric described as Serbian Scout Cavalry - there is a dozen or so of these and they look very much like early Minifigs ACW kepi wearing cavalry sporting an over the shoulder cartridge belt and carrying a carbine; a unit of what look like Wargames Foundry Crimean Russian Dragoons with dismounts and finally a box of around two dozen or so partially painted early Minifigs Boxer Rebellion Chinese. A couple of things have surprised me about all of the figures in this collection. 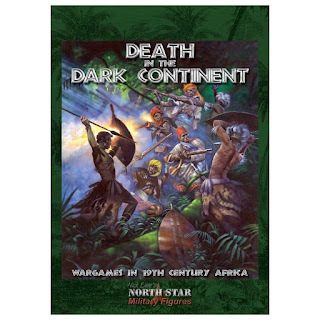 To begin with the only modern ranges that anyone seems interested in are Wargames Foundry, Front Rank and to an extent, Dixons. Everything from Essex Miniatures and older seems to be almost of a niche interest. I am surprised by Essex as in many ways I kind of see them as the forerunner of the trend for larger and more detailed figures. Having said that some of the models do look rather dated by comparison with the newer types. As someone that very seldom buys figures I am probably not the best person to comment on this but that is how I see it. 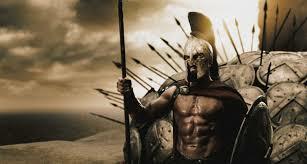 The next big undertaking will be sort sort out the cavalry as I am confident that all will find a home in due course. "At last we meet again....the circle is now complete...."
Huzzah! 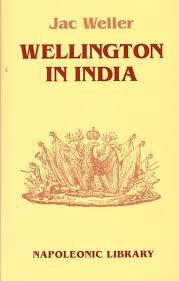 At long last I have finally tracked down a copy of the first in Jac Weller's Wellington trilogy - Wellington in India. I had a copy of Wellington at Waterloo which was swiftly followed by Wellington in the Peninsula. Both of these are first rate works and so, initially more from curiosity than a major interest, I was keen to track down the first volume. Ironically I had picked up the Kindle version during one of Amazon's periodic sales for the paltry sum of £1.19. For sure though, I wanted a hardback version as as I already owned the other two volumes in the Greenhill format it made sense to find a similar edition. 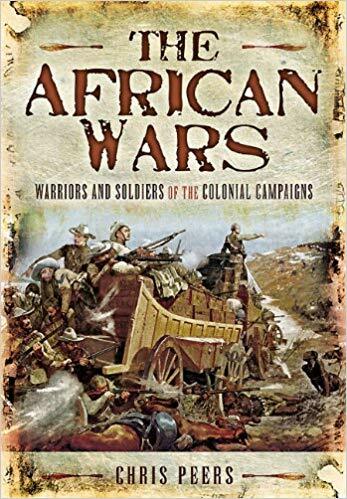 My knowledge of the period of when Wellington was in India is a little hazy, to say the least, but since I have a long standing interest in the wars of the Indian sub-continent it is a knowledge gap that needed filling! I am sure that Jac Weller's book will go a long way towards that. In later life the Duke, when asked what the finest piece of work he ever did on a battlefield simply replied - 'Assaye'. That anecdote alone piqued my curiosity about this stage of the Duke's career. 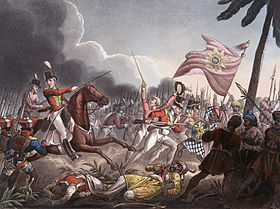 A scene from the battle of Assaye, 23rd September, 1803. At this stage I cannot see myself gaming the period - the same can also be said for the 'Clive of India' era - but It certainly has everything I look for in a campaign - smallish forces and an exotic location to fight over. 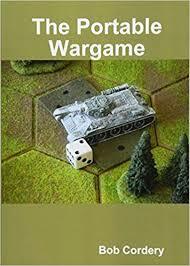 It would be 'doable' from a Portable Wargame perspective but sadly is not on my immediate horizon. 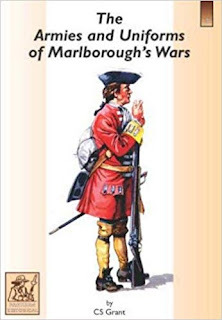 I must confess that recently I have been looking long and hard at the campaigns of the Revolutionary Wars and the British involvement therein. I always had a fondness for Napoleon's Egyptian campaign which would make for a great Portable Wargame style set up. It has been a very positive week for your truly, with lots of forward movement in various directions. A dent has been made in the late 17th/18 century lead mountain as the first units sped off to their new homes. There has been a lot of interest in elements of the collection and so I will need to discuss next steps with Bill upon his return from the US of A. Nothing serious, just a couple of ideas to think about. 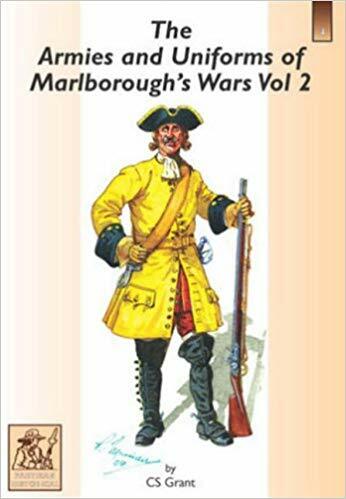 Thus far most of the Minifigs component of the collection covers the Marlburian period - hardly surprising really, when you consider that I have yet to tackle the Seven Years war! - which I am rather pleased about. 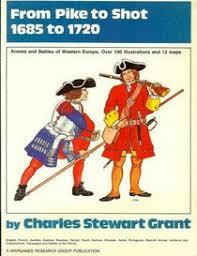 Given that my early 18th century Balkanesque project is set 'twixt 1700 to 1720 this is really handy. In fact, I may even be in a position to properly organise the armies for this so that I can see what I need to add to the collection from Caliver Books. Work on sorting out the Marlburian elements of Eric's collection is entering its final stages and so by next weekend I should be ready to draw up detailed lists of what there is which I will distribute accordingly. As it stands at present the models that are in most demand from the collection are Front Rank, Foundry and Dixon. Essex Miniatures seem to be rather 'Meh' from the gamers I have spoken to. As for the earlier ranges - including Hinchliffe - there has been little interest thus far. I also made a rather unexpected discovery in one of the boxes marked '1685 Sedgemoor Armies'. I opened the box expecting to see serried ranks of pikes and mobs of peasants when in fact the box contained some 1:1200 rather battered (and non-salvageable) dockyard fixtures and two long boxes marked 'Clydeside'. 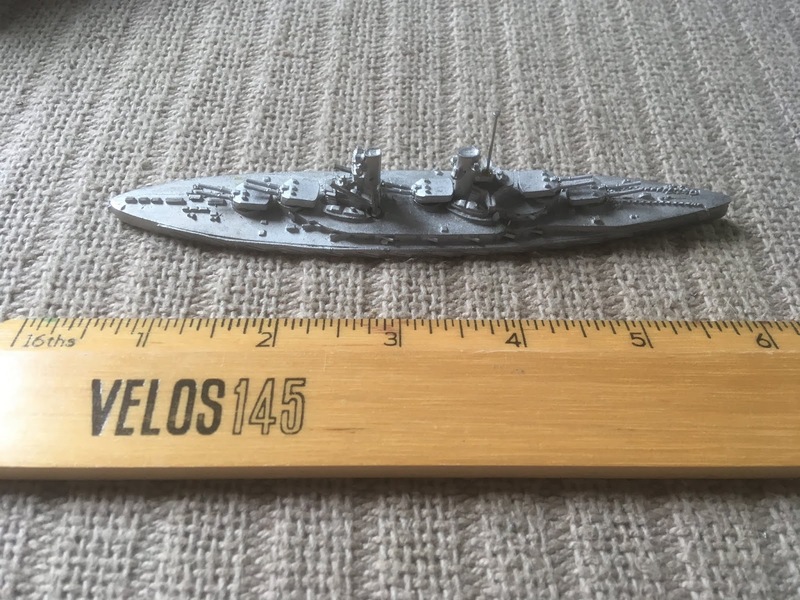 Between the two boxes there contained two each of the following 1:1200th scale warships - HMS Invincible (the WW1 battle cruiser), SMS Helgoland and SMS Konig. these are unpainted and I have no idea of the manufacturer as yet. I will take some pictures and these will form the subject of a later post. I had been after a copy of the old Avalon Hill game Wooden Ships and Iron Men for ages so I was really to picked up an unpunched copy (and with two control pads) at Skirmish yesterday. 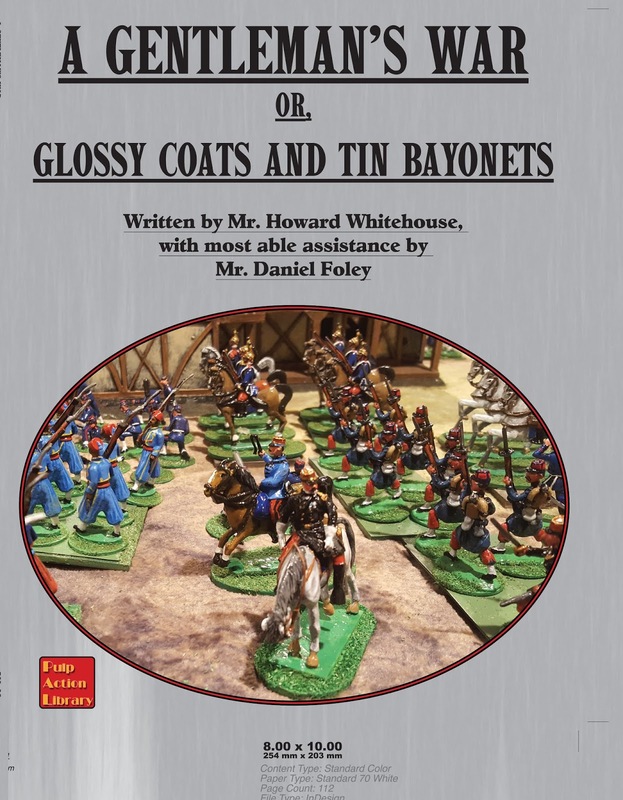 There is a cunning plan associated with this as although the game and the original miniatures rules it was based upon really cover the period from the American Revolution to the Napoleonic Wars, I am looking to make use of them for the Balkanesque project. There was a number of small scale naval actions between the Turks and the Venetians - mainly as a result of the attempted interdiction of supply routes - that would be very game able and involving not only the usual ships of the line but also a host of smaller vessels including galleys and similar. Of course ships of the period in question were not quite as efficient as the later vessels but I reckon extending the tactics and ship types associated with the earlier Dutch Wars would probably be a good base to work up from. In any event I shall consult my local naval oracle in such matters - the redoubtable Mr Fox - as I am sure he will have knowledge about such things! Staying with the naval theme I also sorted out the 1:2400th scale WW1 ships for the 'Not Quite Madasahatta' project. I needed to add a couple of models from Tumbling Dice (duly ordered and received) and upon enquiring had the welcome news from Paul Sulley that at long last the French fleet was nearing completion. It will be rather large in terms of the range of models. He also mentioned that ideally he wants to have all the pre 1914 models completed by the end of the year. It all changed though when he wheeled out the Italians! 'The Devil at the Helm' was the rules we used - very detailed and the more modern the ships became the longer the games took to fight. Good fun though. The library has also benefited from some new additions but these will form a separate post. Finally, I had a very helpful and informative chat with Bob Cordery at Skirmish about the whole self-publishing thing which have aided my thought processes immeasurably. Many thanks once again Bob. Once again Sidcup in Kent saw the biannual Skirmish Toy Soldier and Wargames show held at the Sidcup and Chislehurst Grammar School. 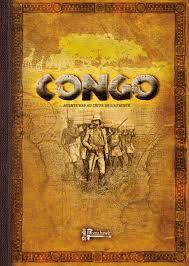 I always like this show as it is quite small, has a reasonable selection of trade (although not as good as in recent years), a pretty good Bring and Buy (again, not as good as in recent years) with a nice range of wargames to look at. This spring the theme was the Sudan so there were four games devoted to the same and with rules ranging from The Men Who would be Kings to Sharp Practice as well as a quite superb old school 54mm scale action. 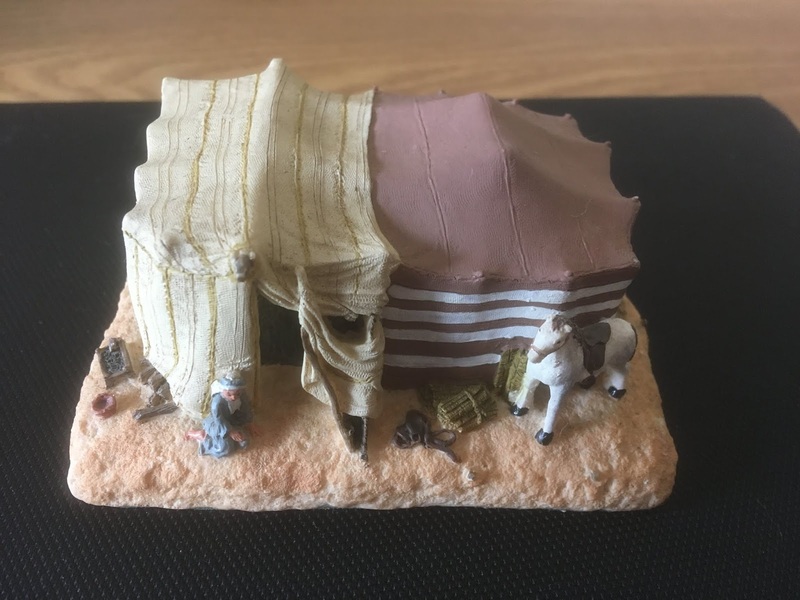 The first picture from the outstanding 54mm Sudan game (based on Tel El Kebir) organised by that very nice chap Andrew Stevenson, proprietor of Replica Metal Soldiers and Models - able assisted by one of the leading lights in the toy soldier world, none other than James Opie. The figures are of course British infantry. The Egyptian position. Note the artillery deployed at the apex of the trench line. The thin red line preparing to advance. Egyptian Artillery deployed at the ready. Egyptian cavalry in reserve and busy guarding the Fez in the background. Andrew Stevenson and James Opie, well known toy soldier expert and author of a number of books devoted to the same - the squint of the latter was no doubt due to some dastardly Egyptian plot to ensure that the British would be advancing into the sun. For the record I would like to extend my warmest thanks to both gentlemen for taking the time to talk to me whilst I wandered about taking pictures. Another Sudan game organised by Rainham Wargames Club (with Clint in the background). No prizes for guessing the rules being used! Described as being ‘Action at Skur-El-Mish - Somewhere in the Sudan 1884’ the steamer used for this originated from an antique shop and received rather a lot of TLC to convert it to the above. Quite superb! 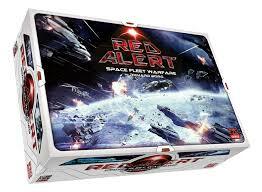 A real blast from the past - unpunched and with two ship control pads rather than just the one. This is the board game version of my favourite set of ‘wind and water’ naval wargame rules called Ship of the Line by the late S. Craig Taylor. The board game uses hexes whilst the original rules used squares. As mentioned earlier in the post, I am rather fond of this show and hope that it long continues although it seemed that the number of attendees and of the trade was down on previous years. It is not a pure wargames show as such but is worth attending all the same. All in all I could think of worse ways to spend a Sunday morning. ....and taken a stage further. 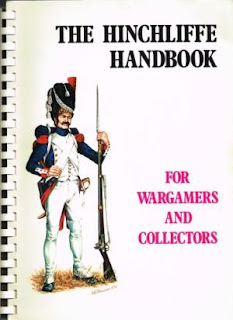 Possibly the pick of the bunch but I couldn't possibly comment....Seriously though, these rules will be forming the basis of my 18th Century project and by merely tweaking a couple of minor points will serve me admirably (note the basing convention used by Bob on the cover). 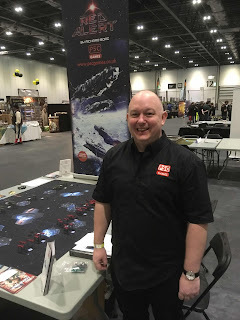 Whilst the grey matter has been absorbed with planning and organising the Minifigs portion of Eric's collection I have also taken some time to review some of the games I have posted about on the blog. 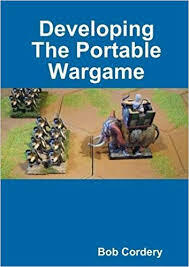 For the most part the land battles used Command and Colours inspired rule variants as well as the Portable Wargame and its predecessors. In each case a grid-based playing area was used - either hexagonal (typically 13 x 9 - the same as a usual Command and Colours playing area) or squared (12 x 8). 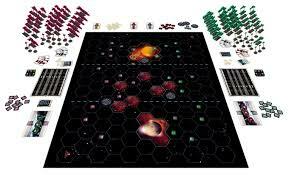 I used three sizes of hex - 4" (Hexon), 3" (Axis and Allies maps) and 45mm (Heroscape). the squares were a uniform 3" throughout. Each size (and shape) has its advantages but for me now the optimum will be 4" and squared. One of the difficulties that arises when using a grid is that if the unit of troops is physically large then the room for any terrain is restricted. In my opinion a unit occupying a grid space should not take up more than half the area if terrain is a feature. With this in mind, and given that my wargames going forward will be largely Portable wargame based, I intend to use Bob's basing convention for my 25mm Minifigs armies. This will be 2 x 3 figure bases for an infantry unit, 2 x 2 figure bases for cavalry and a gun with two gunners for the artillery. Foot command, gunners and riflemen/skirmishers will be on a 1" square base and mounted command on a 1" x 2" base. Using this system means that when a single unit occupies a grid area there will be sufficient room to deploy any terrain that is required. I have opted for a square grid as opposed to hexagonal simply because terrain will be easier to both build and to configure on the playing area. At this stage though I am still debating about using an offset square grid rather than the usual chessboard style. This would combine the best of both worlds in many ways but I have not made any decisions as yet. One of the other points that arose with all this concerns army size. Based on the size of my usual playing area - 13/12 x 9/8 grid areas - a good sized game can be fought with around 8 or so units a side. On occasion I have fought actions larger than this but not by much. As a good benchmark a field force of around dozen units will cover a variety of army selections for use on the tabletop and depending n the scenario being fought. It is always a good idea to have and army slightly larger than you would routinely use so that special units can be cycled in and out of the collection as required. 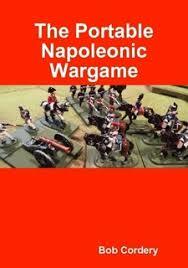 Using the Portable Napoleonic Wargame as a guide I am thinking that my old idea of building up an army consisting of a Charge sized infantry regiment and a cavalry regiment with a gun battery would readily translate into 8 x 6 figures infantry units, 6 x 4 figures cavalry units and two gun batteries. That translates into a full strength army of 16 units under the Portable Napoleonic Wargame which is larger than the biggest action I have fought by 4 or 5 units. I would add a further gun and crew and some rifle/skirmish infantry to the mix meaning in total the whole army would top out around 66 foot and around 28 mounted with three guns. As I survey the inordinate quantity of unpainted metal currently occupying the man cave this figures regime seems the perfect way for me to translate the ideas I have into a gaming reality and so that will be the next step. The great figure sort out of Eric's lead mountain continues and the constituent parts are gradually being sorted into some kind of order. I picked up a couple of hundred plastic grip top bags to help with bagging up some of the figures as well as some other bits and pieces to help with storage. I will need to replace some of the crates Bill used as they have taken a royal battering and in many cases would not survive another move. One of the ongoing problems I am experiencing concerns the small, square blue Hinchliffe boxes. Eric used hundreds of these for his units but they are so old that when you take the lid off the four corner tabs that hold the box together immediately fall off. The house was littered with small brown tabs - the glue had long since dried out - but luckily the lids are not so afflicted and can be used to, in effect, hold the box together. The Minifigs component of Eric's collection is quite large and extremely diverse. Every army in this collection has a contingent of these figures - some more than others - but on their own would be insufficient to produce much beyond a good sized Portable Wargame/DBA inspired force. For me this is perfect as my ideal size of army tops out at around the 150 models mark. Despite the quantity of figures present there are some notable omissions - artillery being the main culprit as there are very few guns in this collection. Eric has a massive painted artillery park and so Bill and I concluded that Eric would have been happy to have used his existing collection and merely replaced the gunners with more modern figures. Needless to say I have been pondering what to do with such a varied and diverse collection. My plan originally was to replicate a number of forces for the 1700 to 1720 period in the Balkans with Venice, Austria, Turkey and Russia being the combatants. This has a lot of appeal and is a nice alternative to the more usual War of the Spanish Succession. However, there are a couple of problems with this idea in that whilst it would have been easy to tackle using the modern ranges of figures in Eric's collection, the Minifigs portion does not have quite the same degree of historical coverage. The solution I am fast heading towards is to use the Minifigs collection as the basis for something set in the region but on an imagi-nation footing. You may recall that this was something I was considering for the mid 19th century following my visit to Corfu last year. All I would be doing would be taking the timescale back 150 years give or take. As mentioned previously, Eric had organised a pair of imagi-nation forces - the Electorate of Bustenberg and the Kingdom of Umbriago. The former was very Germanic flavoured - at least the unit names are - although the figures Eric used ranged from British Napoleonic Heavy Dragoons, French Guard Horse Artillery and Revolutionary era Bicorne wearing infantry to Spanish Napoleonic Grenadiers. The latter was Italian inspired - I rather liked the Hussars de Borgia - although the figures for the infantry are largely Minifigs English Seven Year War. It would be unforgivable if these armies never saw the light of day and so I am obliged to do something with them in some fashion. I have decided to produce them both but using solely the Minifigs portion of Eric's collection rather than the figures he earmarked (especially those for Bustenberg which appear to a fusion of Hinchliffe and Essex). I shall retain the unit names for each side and for their respective historical counterparts I shall look to Austria and Venice for inspiration and ideas. To round out the idea of course the imagi-nation versions of Russia and Turkey will need to be considered (and indeed, I am doing just that) but I am also going to factor in the Grand Duchy of Artois and the Electorate of Kronenbourg in due course. 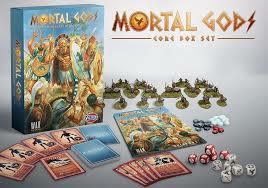 There are more than sufficient figures to cover these armies as long as the sizes are kept manageable. Although my army standard size is around 150 pieces all in, the actual on table fighting portion would typically be roughly around a hundred figures per side, often less. The armies will be organised with the Portable Napoleonic Wargame in mind as these need minimal alteration to suit the earlier and besides, they are a cracking set of rules! The main aim of this expansive project is to make the maximum use of the Minifigs portion of Eric's collection and from a cost perspective I want to have to purchase as little as possible to complete the armies. There is no doubt it will be good to see these table top veterans taking to the field and I hope that in doing so it will help to preserve elements of Eric's legacy and to acknowledge the debt that I, and many others owe him. Minifigs 25mm Pathans (code IC for Indian Colonial). the chap on the right - IC08 is described as a Pathan Officer on the Caliver website which is currently being investigated by Mr Ryan. 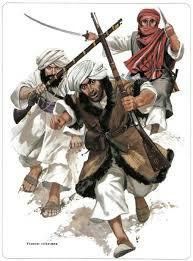 They are rather nice figures and so i have asked to see if there are any pictures of IC 7 - Pathan Advancing. The numbers in circles refer to the amount of figures in each pose. What they should look like or thereabouts. Following Bill's arrival earlier in the week I have managed to sort out the remaining figures from Eric’s unpainted lead mountain and so now have a much clearer of what I am dealing with. I have mentioned previously that Eric had a fairly relaxed approach to mixing manufacturers within not only the same army but even at unit level. A typical example would be an infantry unit with Dixon rank and file, Foundry command and Minifigs grenadiers. 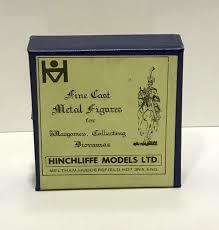 The first order of business then, was to take out those figures that are ‘out of step’ in respect of compatibility - essentially the Minifigs, Hinton Hunt, Higgins and older Hinchliffe types. By doing this, or rather by starting the process, I have managed to sort out fully the 1680 to 1700 ranges for the British, French and Irish armies. There are more figures that would drop into this period contained in the other armies but this will suffice for the time being. In practical terms this equates to around two full crates of figures. Taking into consideration these other armies I reckon there is probably another couple of crates of figures which I shall sort out next before moving on to the Marlburian period. A number of interesting things have arisen from going through all these figures and one of these is that Eric was very fond of his artillery! The number of gunners for everything from siege artillery down to battalion guns and all points of the gunnery compass in between is prodigious. He was also very fond of engineers, sappers and miners and so there is also a good selection of figures for these arms of service. There is also a significant number of Command figures - Eric made substantial use of the Wargames Foundry Marlburian range for this - that goes way beyond the merely functional and typical ‘officer, standard bearer and drummer’ we often see. Substantial numbers of mounted commanders, multiple standard bearers, sergeants, drummers, fifers and officers are the norm and Eric certainly never skimped on this aspect of his armies. Potentially there will be the situation whereby a number of figures are left hat will defy all efforts to be sold - either to known interested parties or via EBay or similar. A chance conversation threw up the question of the ultimate fate of old figures of being melted down, in effect, scrapped. Even this is not an option considered lightly as the older figures have a far higher lead content - presumably ideal for the home casting brigade - so apparently there are only a few figure manufacturers that would consider them. In any event the financial recompense would be minimal. The Minifigs component of Eric’s collection is throwing up a lot of usable material when taken as a whole, rather less so on an individual army basis. My plans for how best to use the models are many and varied but I will reserve my final decisions until I have them properly sorted. Given the diversity of types my thoughts have been very much imagi-nations focused as this would be the most effective way of making use of the variety therein. 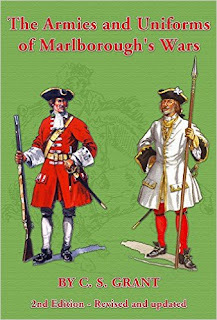 There is a historical precedent of sorts in that I am pretty sure that the armies of France in the first half of the 18th century were behind the curve in respect of uniforms (I am sure that Mr Fox can enlighten/correct me on that score!) so early period figures - Marlburian and late 17th century - could find a home in the Grand Duchy of Artois whilst the more modern looking, Seven Years War era types, would furnish the Electorate of Kronenbourg. The Indian portion of Eric's collection looked very much like it was designed to fight alongside Clive although the mix of figures is somewhat eclectic even by Eric's standard! There are lot of very early early Minifigs ancient Indian spearmen and cavalry with some Renaissance types as well as some 19th century Afghans. The latter consists of Minifigs infantry and Wargames Foundry command and cavalry. I would not be in the least bit surprised if there are some boxes of Foundry infantry lurking around and awaiting discovery. 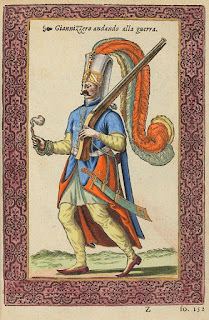 The Minifigs Jannisary figures I have look rather like this dashing fellow with a full set of plumes on his headgear. The Turks are rather a mixed bag with most of the infantry (including the Janissaries) consisting of Dixon and Essex but with mainly Minifigs gunners. There are a couple of units of train guards consisting of Minifigs Turkish infantry armed with what looks like a Jezzail - Eric had added these so I will need to find out what the original figure was. Two boxes of Minifigs Janissaries (around 80 figures worth) and some 60 or so cavalry complete the collection.